Board votes to ask MSBA for 2 to 3 more months, but selectmen appear poised to block revote on project. 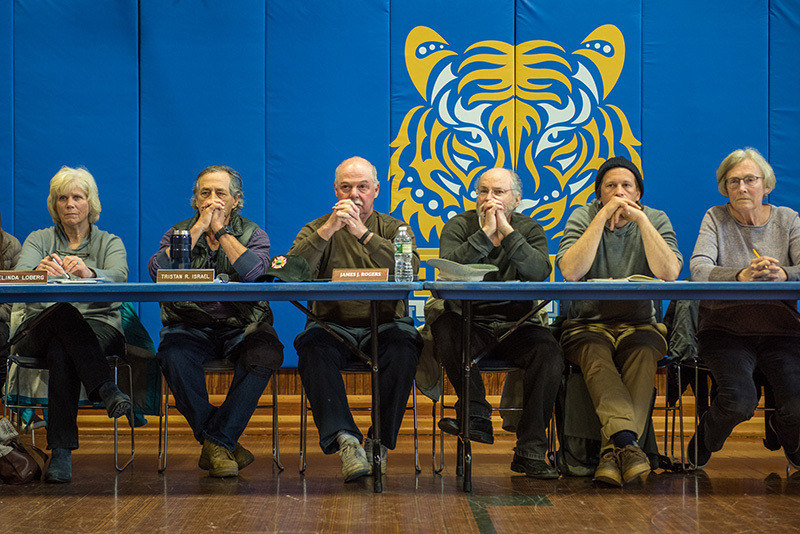 The board of selectmen, shown here at Monday's building committee meeting, rejected a plan to ask for more time on the school project. From left, Tisbury selectmen Melinda Loberg, Tristan Israel, James Rogers. The Tisbury School Building Committee voted Monday to ask the Massachusetts School Building Authority (MSBA) for a two- to three-month extension, after a failed townwide vote on a $46.6 million new school. The vote was 14-2, with selectman Melinda Loberg and town administrator Jay Grande voting against the extension. The full board of selectmen was at the meeting, but has scheduled a meeting for Thursday at 4 pm to discuss the issue. The school committee unanimously endorsed the extension. Tisbury has only until Tuesday, May 8, to formally respond to the town vote in a letter to the MSBA. It’s unlikely the board of selectmen would put a revote on the ballot without any changes made to the plans. 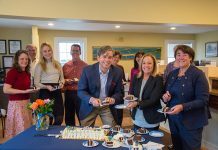 Selectman Tristan Israel has been an outspoken critic, Loberg has lobbied for a new vision for Island schools to share costs, and newly elected selectman James Rogers also spoke out against the school project. “I would have a hard time going against the vote of the community,” Rogers said. Israel left some hope, saying that he has an open mind to the extension, but only if the discussion is about more than just a revote. “The project as it costs now is not something I could support,” he said. Jeff Kristal, the finance committee’s representative on the building committee, said the message from voters is that Tisbury taxes are too high. He said he’s hopeful that town leaders will begin to take seriously the need to sell off property and seek payments in lieu of taxes from exempt nonprofits to ease the burden on taxpayers. That could make the debt for the school more palatable. “Let’s have a broader discussion of how we can offer relief to taxpayers,” Kristal said. 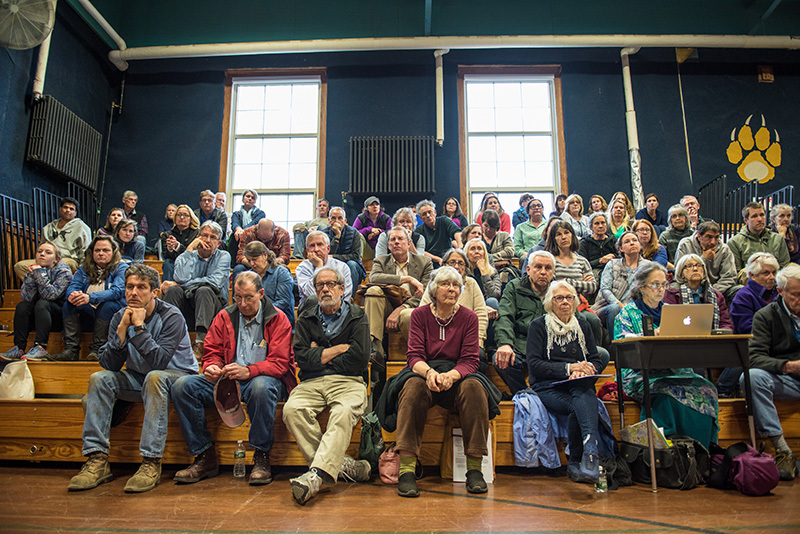 Monday’s vote came before a gymnasium packed with people on both sides of the issue. 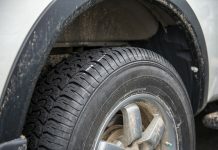 The debate, which got contentious at times, with allegations of misinformation being spread on one side and a building committee that stubbornly went forward on the other, went in circles for more than 2½ hours before chairman Colleen McAndrews called for the roll call vote of the building committee. Discussion among building committee members was split between those who want to go back before voters with the same plan because it lost by only 21 votes, and others who want to use those two to three months to explore all options and decide whether to seek a revote or seek an alternative plan. Even if selectmen support the extension, there’s no guarantee it will happen. The MSBA, which has given the town 10 business days to respond to its election, has the final sign off. 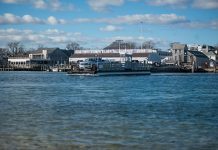 “They’ve got a lot of communities lined up to take your $14 million,” said Richard Marks, president of Daedalus Projects and the owner’s project manager, who has consulted with the town on the school, noting the reimbursement the town would have received from the state agency. The town’s portion would have been $32 million, and would have required a Proposition 2½ debt exclusion that would have added $108 for every $100,000 of property valuation in Tisbury. The building committee had two other options before it Monday — to call for an immediate revote before June 14, which would require endorsement of selectmen, or just withdraw the project completely. The size, location, and cost of the school can’t change, although a decrease in the cost is acceptable so long as it still meets the educational plan of the school, Marks said. If the town doesn’t seek to revote the project, the odds of getting back into the MSBA queue are slim, and will take time. Fifteen projects out of 600 submitted to MSBA have failed to win voter support, and only four have been successfully readmitted to the state funding program, McAndrews said. 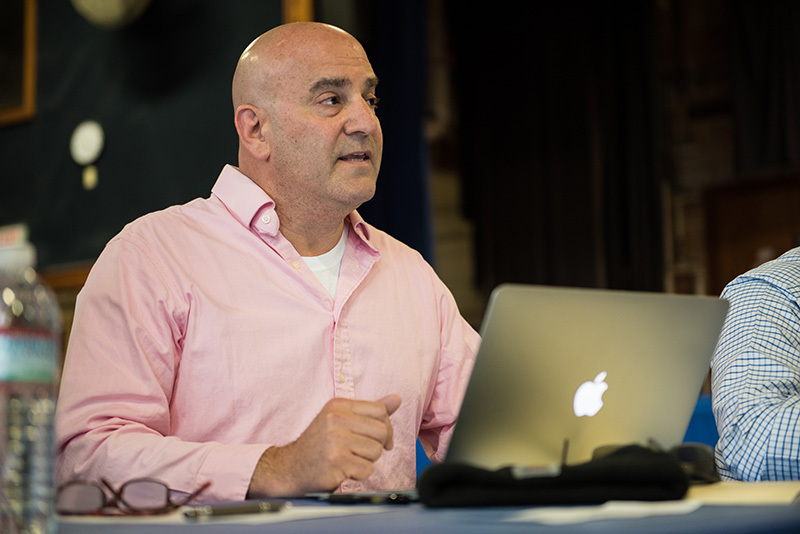 Tisbury School Principal John Custer pointed out that applications were due for MSBA funding by the end of April, and will be considered in January, which leaves 2020 at the earliest that Tisbury could get back into line for state funding. And as several people pointed out, construction costs will continue to rise in the interim. “I fear, ultimately, you’re going to get a lesser school for more money,” Superintendent Matt D’Andrea said. 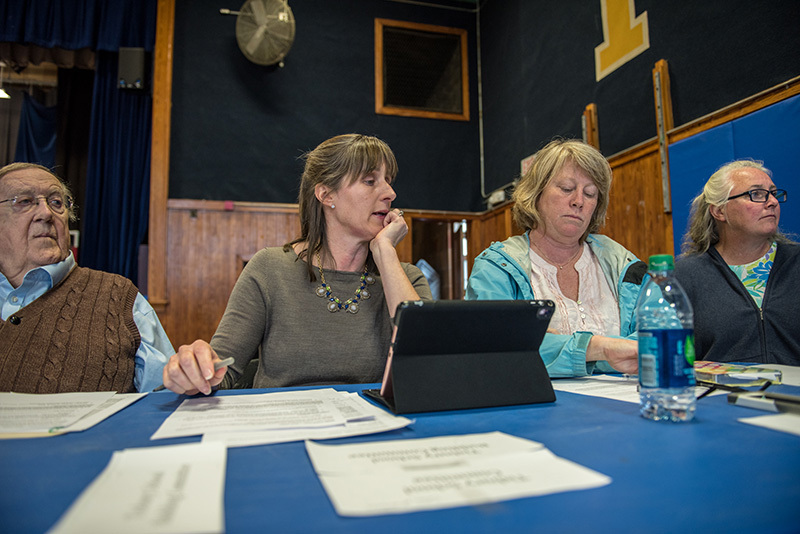 Joining the building committee in the school’s gym were selectmen, the school committee, the planning board, and the finance committee. Each of those boards has a representative on the building committee. Their comments mirrored the comments of the crowd, which was still very much divided. As quickly as someone pointed out that only 32 percent of the town’s voters went to the polls, leaving two-thirds of the town’s 3,529 registered voters unaccounted-for, someone else would say the vote represented the will of the majority of voters. 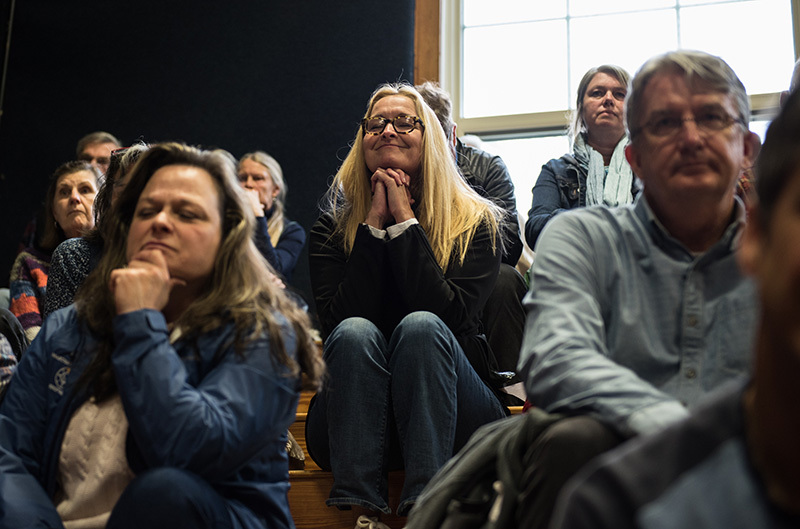 “In my mind, there were two votes, and it’s now tied,” school committee member Amy Houghton said, a reference to the overwhelming vote in support the new school received at town meeting. But Dan Seidman, a Tisbury planning board member who served on the building committee, said after a proposal to have a secret ballot failed at town meeting, some voters felt pressured to stand in favor of the school. 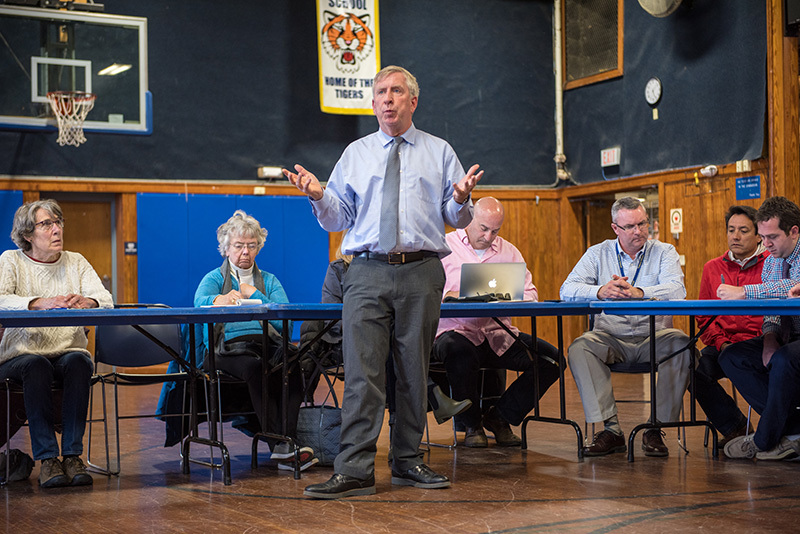 The building committee was criticized for having a new school on its agenda from the get-go without giving enough credence to a renovation and addition to the existing school. The building committee countered that renovations were explored and found to be more costly because of temporary classroom space that would be needed during construction. Erika Mulvey, a building committee member, called out Seidman and Loberg for not publicly endorsing the project with their constituents. “The whole building committee should have supported the project,” she said. Audience member Derek Fairchild-Coppoletti said town leaders have failed to show leadership, and called on the committees to bring a unified project that the town’s voters can ratify. “You have brought dissension and disinformation and a disservice to this community,” he said. Planning board member Elaine Miller stood up and applauded his comments. Earlier, Miller took direct aim at Israel, saying he offered little substance to show that the project couldn’t be afforded or could be done more cheaply. “I can’t go with subjectives. I need facts,” she said. Planning board chairman Ben Robinson said the vote shouldn’t come as a surprise. Not enough credence was given to renovations, which he maintains would be cheaper. “We should go forward respecting the vote,” he said. 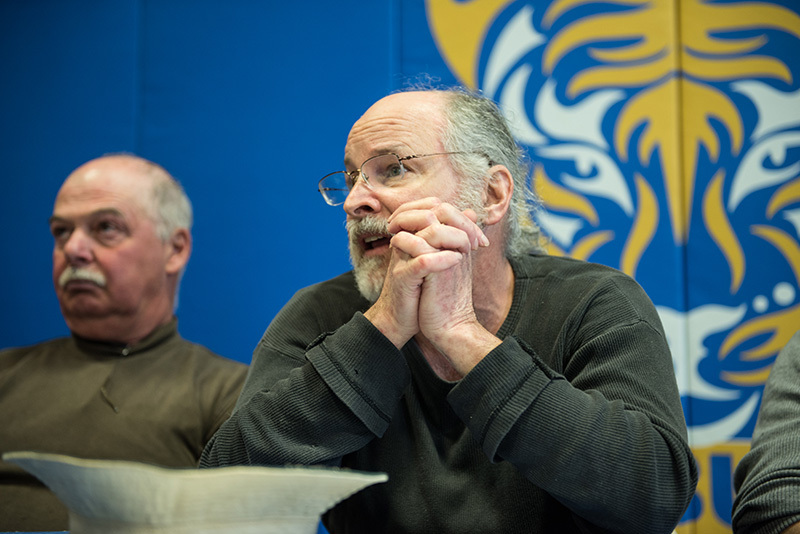 Harold Chapdelaine, a member of the building committee who initially opposed tearing down the school as a member of the historical commission, took issue with numbers that were talked about publicly for renovating the school. “I think there’s a lot of people who have failed to educate themselves about how we got to this point,” he said. Even if the unsubstantiated numbers were correct and the school could be renovated for $25 million, the savings to taxpayers is minimal, Chapdelaine said. The difference in taxes would be $25 less per $100,000, he said. “They are asking you the voters to gamble on that,” he said. Paul Lazes, a town resident, said, “Taking the building down flies in the face of preservation,” something important on the Vineyard. He said any extension of time should be to do a thorough study of the costs of renovation and addition. 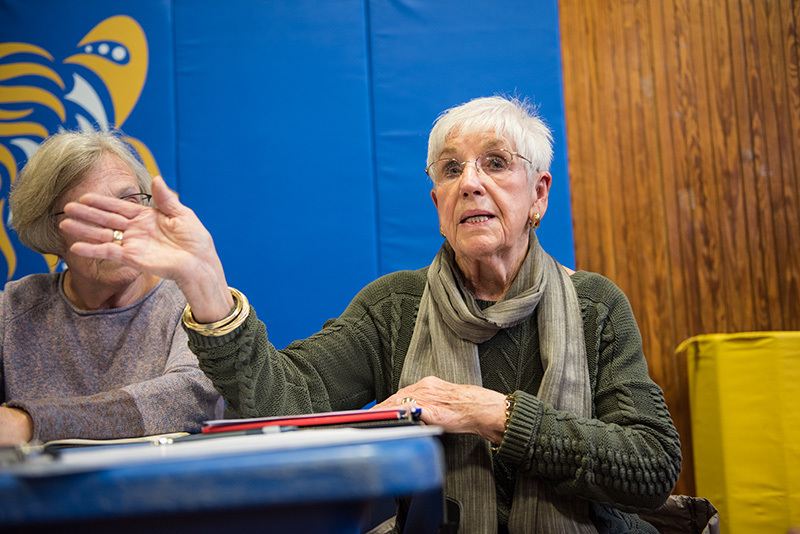 School committee member Janet Packer said there were “hidden agendas,” and although she didn’t mention them by name, she pointed to the selectmen’s vote to support moving forward with the project in February, though the final project did not have their full support at the polls. “For me, if we move forward, everybody has to be out in the open where they stand,” she said. Planning board member Cheryl Doble suggested having another group of people look at the project with a fresh set of eyes. “If we’re not going to stay with this, then we need to know where we are headed,” she said. Dawn Bellante Holand, another member of the planning board, suggested a survey to determine why people voted against the school project. Len Morris, who described himself as a journalist, lobbied for more time, saying some of the information put out by opponents was wrong. He pointed to one instance where someone took the total cost of the project and divided it by this year’s enrollment to come up with a $128,000 per pupil cost for the school. Since the school is being built to last at least 50 years, that cost is more like $2,800 per student, he said. The town has spent $825,000 on the plans and feasibility studies for the new school; about $337,000 of that will be reimbursed by the MSBA. None of that money is available for further study, McAndrews said. Katherine Scott criticized some building committee members for disrespecting voters as being misinformed. She said some people just didn’t like the plan. “That’s how the voting system works in this country,” she said. Another resident, Tony Peak, said he was “angry and insulted” that people were openly questioning why people voted the way they did. Assistant Superintendent Richie Smith said it would take a collective approach to move forward. “We’ll never get more than a split vote if everyone at this table is split,” he said. An island our size can have one school for everyone. We have one facility for high school, let share one facility for all the towns for elementary. All year residents already have a hard time living here and yet some people want their taxes to go up by 500 or 1000 per year for this school alone. Craziness. Israel is doing the right thing. 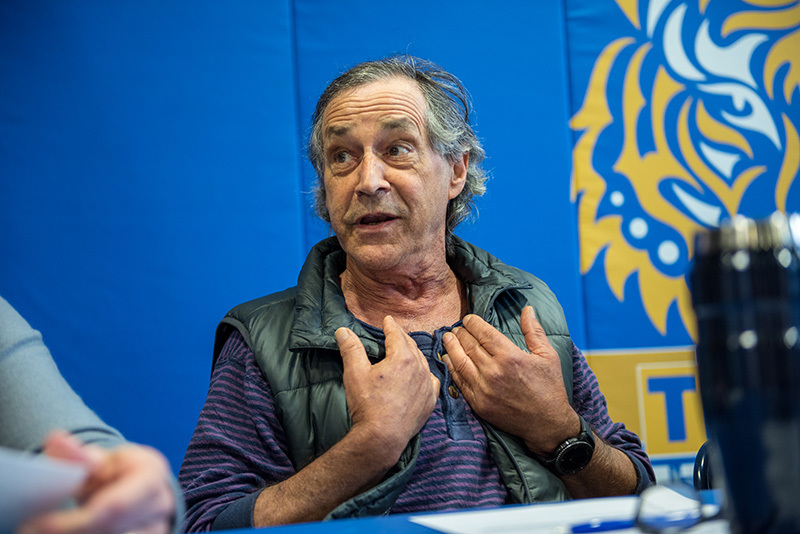 Mr. Israel didn’t say he was against the school he said that the $32 million price was to much. He said anything $30million or under he’d vote for. So I’d like to know what the tax difference on the 32-29 million price tag is? Is it $400 a year? $450 a year? So andrew you’re really only talking about an incremental increase of $50 to $100 dollars a year and I believe it’s not for 20 years but decreases from there on over the 20 years. Just asking because I do not know. They lost the vote, if people truly cared they would have shown up at the polls and voted.